How Do I Know I Can Trust These Reviews? My husband and I were very impressed with the way everyone at CDV quickly turned a bunch of strangers into a bonded group who cooked and travelled so well together. Food, friends and fun, is how I would describe our week spent with CDV. After reading the reviews of those who have also taken this tour, I feel it has all been said, but I will add my voice to the accelades anyway: It really is all inclusive; the accommodations in Soriano are lovely; the villa and its surounding countryside is truly beautiful; Michael, Rocky and the rest of the team know just how to create a relaxing, welcoming atmosphere there that makes it so much fun to cook and socialize with everyone. In fact, my husband and I were very impressed with the way everyone at CDV quickly turned a bunch of strangers into a bonded group who cooked and travelled so well together. Our tour guides, Linda and Spartaco, regaled us during the travel segments with wonderful stories about Roman, Etruscan and papal history, while also making us laugh...A LOT!! We loved all the sites they chose to show us. The only regret was that we wished we had more time in each place. 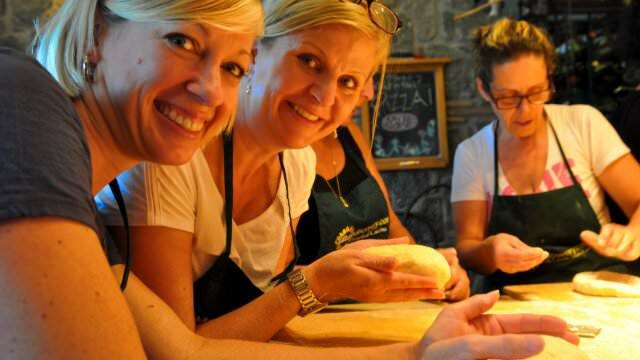 We particularly enjoyed our days spent cooking with Carla and her crew at the villa and despite the relaxed atmosphere of the classes, we really felt we learned a thing or two about cooking authentic Italian dishes. Even more importantly, perhaps, was how much we enjoyed eating what we cooked! Learning to make ricotta cheese, grappa, and limoncello was also great fun. And since returning home, we have made several of the dishes for family and friends to super reviews! When the tour was over, my husband and I had time to reflect on the week as our amazing trip through Italy continued. What we were most surprised and so pleased to discover was just how much we had learned about Italian culture, from each member of the Culture Discovery family! Get all the latest information on our newest vacations. © Copyright 2019 Culture Discovery Vacations. All Rights Reserved.